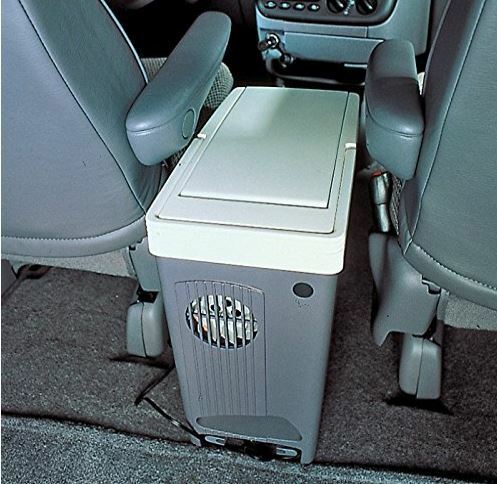 The Koolatron P-20’s ultra-compact design is perfect for small cars. It has a unique narrow and tall shape that fits perfectly behind the passenger or driver’s seat. You can also snuggle it on the floor under the glove box. The cooler uses thermoelectric technology that maintains the inside at around 40 degrees Fahrenheit below the outside temperature. It’s not as efficient or powerful as a mini-fridge but it will do for road trips, RVs, boats and camping. The main complaint from users is that it is a bit fiddly to use. You have to be careful to organize your drinks and foods in such a way that cold air can still flow freely inside. Some users left their drinks for hours only to find it still tepid. This is most likely because the fan is located at the bottom where it can be easily blocked by items. Read on for our full review of the Koolatron P-20 thermoelectric cooler and warmer. If you are looking for a slightly larger cooler, see our reviews of the best compact 12V coolers for recommendations. Ultra-compact design – great for small cars. Includes swing-up carrying handle for easy portability. Dual function – cools and warms. Pricey considering it has lower capacity than comparable coolers. Takes time to learn how to use it properly. Relatively small capacity – not ideal for families or large groups. 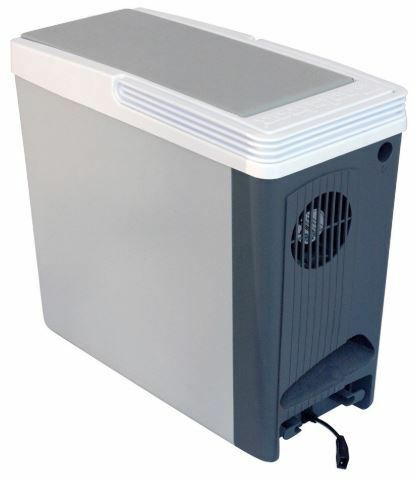 If you are tired of constantly adding ice to your ice chest and draining water – not to mention frequently finding a soggy mess inside – a thermoelectric cooler is perfect for you. The Koolatron P-20 doesn’t need any ice and no maintenance is required other than occasionally wiping the inside and outside. Like most thermoelectric coolers, the P-20 has dual functions. You can use it to keep your food and drinks cool and you can also use it to warm food to 135 degrees. The warming function is handy when you are out camping, on picnics or when you need to warm baby food/milk while on the road. Before you buy the Koolatron cooler, or any thermoelectric cooler, understand that it’s far from a refrigerated cooler. It will not freeze your drinks or food if you put them in unfrozen. While it can cool down stuff, it takes hours. Yeah, thermoelectric technology is not the most efficient cooling method. But for on-the-go cooling, it is perfect. 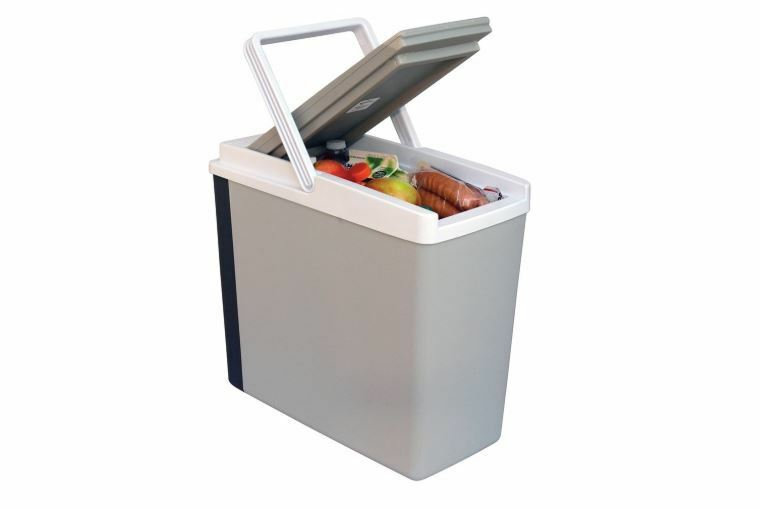 To get the best out of the Koolatron cooler, only put in cold or frozen stuff. Plan your trip and freeze or chill your drinks the day before. Then put them in the cooler. They will stay cold or frozen for days as long as the cooler is plugged in (you can unplug it for a few hours and it will stay cold). You can also buy cold drinks on the way and keep them cool inside the cooler. The cooler keeps the interior at 40F below ambient temperature. Even if you are travelling to a hot place, it can stay cold. Just make sure you don’t block the fan at the bottom of the cooler as that will keep it from going cold. Don’t worry about having enough trunk space to fit the cooler. It conveniently fits between on the floor of the car between the front and back seats. If you are driving solo, you can place it on the floor under the glove box. 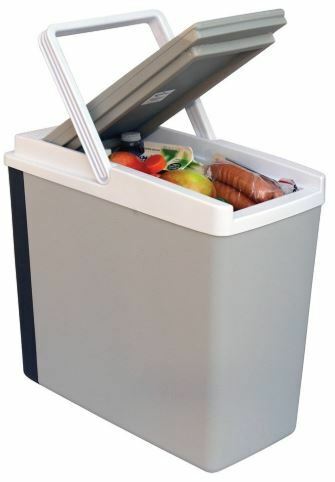 Being able to store it in the car rather than the trunk makes it easy to get drinks or food from the cooler without having to stop and open the trunk. The Koolatron P-20 plugs into your car’s 12V socket. If you have a solar generator, you can also power it using the 12V DC outlet. If you want to keep the cooler powered in a hotel room or at home, you’ll have to buy an AC adapter separately. You are looking for an ultra-compact cooler that will fit in your small car. You want a thermoelectric cooler that can also warm food. You want a low-maintenance cooler. 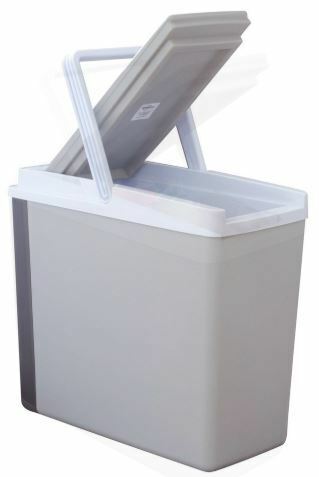 You are looking a large cooler that can store enough drinks and food for a large family or group. You want a cooler that can freeze your drinks and food. Get a mini-fridge instead.